The Arms Procurement Commission has called former president Thabo Mbeki and his key Cabinet ministers to testify, as the inquiry shifts focus to allegations of fraud and corruption, and the controversial industrial offset programme. Mr Mbeki will be questioned in the middle of May as head of the Cabinet subcommittee that recommended that the arms purchases go ahead. Apart from the former president, former finance minister and now National Planning Minister Trevor Manuel and former trade and industry minister Alec Erwin, will appear before the commission of inquiry later this month. Also on the list of witnesses the commission released on Wednesday is Absa group CEO Maria Ramos, who was director-general of the Treasury at the time the arms procurement deal was authorised. 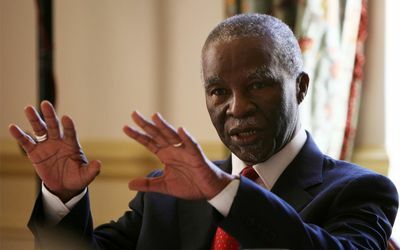 The appearance of Mr Mbeki and his former ministers may go some way towards answering crucial questions about the deal. They will be questioned about the rationale for the arms purchase. Further, the commission is set to seek answers on whether the arms and equipment acquired are underutilised or not utilised at all and about the offsets that the winning bidders were obliged to deliver under the national defence participation programme. Commission spokesman William Baloyi said the witnesses on the list had been informed. "Subpoenas have been issued and will be served on all the witnesses appearing in the programme. "This is a necessary legal safeguard to ensure their attendance, but it in no way implies the witnesses have not been co-operating with the commission ." The list of witnesses was not exhaustive and many others still had to be called, Mr Baloyi said. "The next phase will feature the witnesses who will testify on the allegations of impropriety, fraud and corruption ." Apart from one or two exceptions "no allegations of impropriety and wrongdoing have been levelled against the witnesses appearing in the current phase", Mr Baloyi said. "They are being called because of the roles they played in the acquisition process. "It is expected that some of the evidence around the offsets and the process followed leading up to the award of some of the tenders may contain allegations of impropriety and wrongdoing, that properly fall within the purview of other terms of reference." The commission would hear such evidence during this phase to avoid the recall of witnesses. Public hearings of the Arms Procurement Commission led by Judge Willie Seriti will resume on January 20 and run until May 16. In terms of the proclamation President Jacob Zuma issued it was to have completed its work within a two-year period, which ended in November last year. But the commission has been given an extension of another year. The first 24 days of the next sitting will be dedicated to hearing the testimony of Department of Trade and Industry officials, including current director-general Lionel October and Mr Erwin. Armscor officials will then testify about the offset programme for 19 days and then the Department of Defence ­ including former minister Mosiuoa Lekota, former deputy minister Ronnie Kasrils and former secretary of defence Pierre Steyn will appear. In April it will be the turn of the former Treasury team, including deputy head of the Reserve Bank Lesetja Kganyago, the then Treasury head of international financing, and current deputy director-general Andrew Donaldson. The chief negotiator for the arms package, Jayendra Naidoo, is also on the list of witnesses. With acknowledgement to Linda Ensor and Business Day. Albeit things being delayed and other than the omission of Chippy Shaik Chief of Acquisitions and R.C. Simpson-Anderson Chief of the SA Navy, the programme is looking a lot more like it should for a full and proper ventilation of the matters before us. Also it looks like Roland White is still playing chicken.